Having a kayak roof rack is very important because most often transporting kayaks to the kayaking spot can be very difficult. Kayaks are not so portable, they are not one of those things you toss into the trunk of your car and zoom off, they are much harder to transport. But owning a kayak roof rack will make transporting your kayak easy. This is the fastest and easiest way of moving your kayak from your home to your kayaking spot. Roof Racks for kayaks are designed to help you be able to carry your kayak on the roof of your car to wherever you want to take it to. Roof racks are safe, efficient and very easy to assemble and install. There are different brands of kayak roof racks, but not all are good or will be suitable for your use. This article will review top ten kayak roof racks. This Kayak roof rack will securely hold your kayak securely and can be mounted on all load bars and crossbars. It doesn’t take up much space and it can carry kayaks that weigh 75lbs and are 36 inches wide. it is designed for easy removal or installation of hardware. The steel has adjustable padding that ensures the protection of the kayak. This Kayak Carrier leaves enough space on the roof.It weighs just 8 pounds and has total dimensions of 18 inches by 7 inches by 7 inches. On Amazon.com it has 3.7 stars rating out of five stars. The bars of this kayak roof rack is made of steel tucks that are 1.5 millimeters thick. It has four straps that securely hold in place kayaks that weigh up to 150lbs and are 36 inches wide. The paint of this kayak Carrier is resistant to harsh weather (rain or sun). The base is made of genuine foam and rubber. It is made of high-grade steel and resistant to rust or harsh weather. This Kayak Carrier rack can be used to carry canoes, short and longboards and Kayaks. It has a rubber coating on the sides as well as corner pads that can be adjusted to shield your boat from any form of scratch while transporting it. It has a floating strap system that makes loading and unloading of kayaks very easy. These floating straps elevate the buckles. Loading and unloading kayaks on this kayak Carrier is very easy. The bolts are a bit long, therefore they may dig into the roof of cars with low cross bars. The Stoneman sports PS-42L is a wall mount rack for storing your kayak in a storage shed or in the garage. This helps to securely hold the kayak in place and prevent it hear from being damaged when it is not in use. It is easy to install and assemble. The rack can be mounted straight or at an angle to suit the preference of the user. The hardware is a bit fragile and may break if a drill is used wrongly on it. 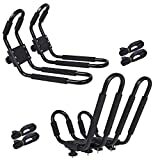 The Yaheetech Kayak Carrier is made of quality material and it is durable and sturdy. It can be easily and detached to the roof rack of any vehicle. Although it comes unassembled, it can be East assembled within a short period of time. This is a universal Carrier that can be used to carry not just kayaks but also sailboats and canoes. It has four rubber pads on it that helps to avoid scratching and damaging of the surface. This Kayak Carrier can be used on any load or roof rack that had cross bars. It has two straps that help to hold the kayak securely in place. This J-Bar can be mounted on any crossbars. They can be used to carry canoes, snowboards, skis, paddleboards and so on. It is constructed from heavy-duty steel that is water resistant, the arms have a foam cushion, it also has a rubber base with cargo straps to hold your cargo firmly in place. This Kayak roof rack can be folded to allow your car to fit into your garage without it being removed. The brackets of this Carrier rack are 15 1/2 inches high, 4 7/10 inches wide and 14-3/5 inches long. It also comes with one set of rust-resistant mounting hardware, this item weighs 16 pounds. It has total dimensions of 17.5 inches by 12 inches by 6.5 inches. It has a weight capacity of 165lbsIt has a good rating of 4.0-star rating on Amazon.com. 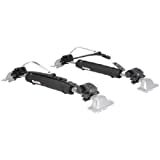 The Thule kayak Carrier has a dual position design that enables it to carry two kayaks at a time. It can be transformed from a J-cradle to a two boat stacker position and vice-versa. It has a universal mounting design that enables it to fit any type of LG loader bar, even those that are 80 millimeters wide. This Kayak Carrier can be folded up when not in use. It has a bow, a stern tie and buckle bumpers that hold your kayak securely in place. It can two boats that have a combined Weight of 130lbs and individual Weight of 75lbs or less. 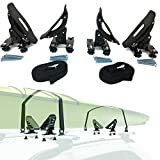 It doesn’t require any assembly because it is already assembled from the company.This Kayak Carrier weighs 12.5 pounds and has total dimensions of 20 inches by 9 inches by 20 inches.On Amazon.com it has 4.2-star rating out of five stars. This Kayak roof rack can easily conform to the shape and size of any kayak. It has rubber saddles that help to secure the kayak and prevent it from getting scratched. It has Pivoting saddles for easy loading and unloading of the kayak. This Kayak Rack is made with high-quality stainless steel and can withstand any weather condition sorry season. It has a universal hardware that is compatible with any crossbars. It also has stern tie do and heavy-duty straps for holding kayaks securely in place. The total dimensions of this kayak are 15.2 inches by 11.7 inches by 5.6 inches. It weighs 10.7 pounds.On Amazon.com, it has 4.2 stars rating out of five stars.Item Weight 10.7 pounds. It has two saddles that hold your kayak securely in place even in storms. The RoofTop Universal Kayak Rack can mount on crossbars that are 2 1/2 inches thick and have a minimum width of 2 1/2. This Kayak Carrier is coated with steel and it has soft rubber pads and four-point flexible saddle for easy loading of the kayak. This Kayak Carrier helps to hold your kayak securely in place and occupies little space. It comes with two nylon tie down straps and one set of four pieces kayak Carrier System.The total weight of this kayak Carrier is 9.37 pounds. It has total dimensions of 12.6 inches by 8.7 inches by 6.9 inches.On Amazon.com it has 5.0-star rating out of five stars. It is more suitable for use with small kayak, it can’t carry big kayaks that weigh more than 150lbs. The dimensions of this kayak carrier are 17.5 inches by 10.9 inches by 10.6 inches. 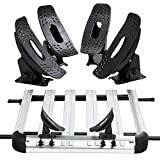 It weighs 13.2 pounds.On Amazon.com this kayak Carrier rack has a 5.0-star rating. CAR TYPE : The first thing that should be considered before buying any roof rack for a kayak is the type of vehicle you have. It is important to consider the height of the car and your ease of access to the roof of the car without needing a ladder, if the car is too high for you to reach, then placing your kayak on it may be a problem. In situations like this, it is advisable that you buy a kayak rack that the kayak can be easily loaded to without any stress. It is also necessary that you check the shape of the roof of your car to see if it is flat or rounded Most cars with rounded rooftops can only carry one kayak at a time but cars with flat rooftops are more ideal for transporting more than one kayak at a time. PADDING : It is also important that you consider they padding of the kayak rack before purchasing it. If the racks are not padded, then your kayak can be badly scratched, having a kayak rack that is padded will eliminate this concern. Foam pads are actually the best type of padding because they can be transferred from one vehicle to another and can be easily replaced. If you are interested in keeping your kayak free from scratch them foam padded racks are what you should go for. SIZE OF THE KAYAK : The size of your kayak should be considered before buying any kayak rack. Ensure that the rack you buy can comfortably contain your kayak. Also, put into consideration the number of kayaks you intend to carry. There are different types of kayak roof racks, some are designed to carry just one kayak, some can carry two while some can carry multiple kayaks. Consider the number of kayak(s) you have and buy the appropriate roof rack to suit the numbers. STRAPPING : The security and safety of your kayak are very important, especially while in transit. Ensure that any kayak roof rack you buy is capable of strapping and holding your kayak securely in place. There are different ways of strapping kayaks to roof racks, they can be strapped at the front, at the rear of the vehicle or even through the window. Whichever style of strapping you prefer, ensure that you buy a rack that straps well and can hold tour kayak securely in place especially when you are traveling a long distance. You would definitely not like seeing your kayak fall off while you are in transit so ensure you buy a roof rack that straps well. All the roof rack for kayaks reviewed in this article are made with strong and durable materials and are designed to serve you for long. It is, however, important to note that roof rack kayaks have maximum weight capacity they carry. If you want your kayak rack to last long, ensure that you adhere to the maximum weight capacity stated by the owner. Buy the roof rack that best suits the weight of your kayak. If you do so, you won’t have any complaints. 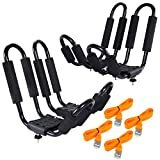 In case you do not know where to purchase any of these roof racks for kayaks, they are all available on Amazon.com and can be purchased at a very affordable price. Once your order is placed, you won’t have to wait too long for your roof rack to be shipped to your doorstep. Agreed. The size of your kayak should be considered before buying any kayak rack. The last rack I bought did not comfortably contain my kayak and you can imagine just what I had to go through trying to manage it each time I’m transporting the kayak. I really got frustrated at a point and that is exactly why I’m taking my time and weighing my options before settling for another one. Ok noted. The number of kayaks one intends to carry would influence the type of kayak roof rack to buy. There are different types of kayak roof racks which are designed to carry just one kayak, two or even multiple kayaks. I’ll put that in mind when choosing thank you. 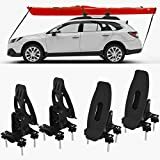 Trust me, this Car Rack & Carriers Universal Kayak Carrier can easily conform to the shape and size of any kayak and that’s what makes it almost everyone’s favorite brand. It also has rubber saddles that help to secure the kayak and prevent it from getting scratched so you are sure that transporting your kayak is safe and no damage will be done on the way. Kayaks are not so portable, so roof racks are necessary since they are safe, efficient and very easy to assemble and install. This Protek 2 Pair J Shape Bar Kayak Carrier star seems to be long and firm and looks like it can hold heavy kayaks securely in place just as I want it. Looks like I’ve found a kayak roof rack already hehe. This Stoneman Kayak Rack was my best choice after reading through the guide here. I went ahead to purchase it and I must say it is truly rust-resistant and a lot of things too but the screws that come with it are not so good. If you are fine with that and won’t mind changing them as I did, then it will be your best option.